In 2016, esports experienced even more highs and lows than the previous year. That’s what it means to be growing. But while the industry surrounding competitive gaming continues to expand on the backs of enthusiastic investors and hype-men, it’s important not to forget why anyone actually watches it in the first place: the people playing are really damn good. Beyond the pageantry and rivalries, the shout-casters and sponsors, the reason esports exist at all is because putting top talent into tense situations where it feels like everything is on the line turns out to be a magnificent way to bring out the best in competitive games. Unexpected triumphs, brilliantly orchestrated defeats, all combine to add an extra layer of drama and artistry to games that would otherwise feel hollow and incomplete. With that in mind, here’s our selection for some of the best plays in professional gaming we witnessed in 2016. Blizzard’s collectible card game has always been criticized for the outsized roll that RNG (random number generation) can sometimes seem to play in pivotal games. But those moments of unexpected good fortune (or bad if you’re on the receiving end) are also part of what make the game so exciting to watch. Without that added bit of surprise, Hearthstone wouldn’t quite be a card game anymore. One of those moments occurred during the quarterfinals of the Hearthstone World Championship. Pavel “Pavel” Beltukov, who would go on to win the tournament, seemed to be spinning his wheels against William “Amnesiac” Barton in the latter part of game six. But just when his opponent seemed ready to send Pavel packing, a scene straight out of Maverick occurred. He drew Babbling Book, a card that summons a random spell, and one which in this case just happened to grant Pavel the perfect spell to completely turn the game around: Polymorph. With it, the young Russian was able to neutralize the biggest threat on the board and effectively reset the game in his favor. The kicker? Babbling Brook was one card in particular that Amnesiac had decided not to include in his own otherwise very similar deck build, meaning it took some foresight and planning on Pavel’s part to induce fortune to smile upon him. In only the second ever Rocket League World Championship, FlipSid3 Tactics placed first after a series of great plays from both sides. But nothing they pulled off managed to come anywhere close to some of NRG’s finer moments. In a two-strike combination play that left many people’s jaws on the floor, SadJunior and Jacob connected for a moment of pure brilliance during the first game between the two teams. What looks like one player coming up to block the other’s shot is actually a coordinated effort by one teammate to redirect the other’s shot at the last second to make it practically impossible to block. While the teams for the Overwatch World Cup were mixed between pro players and popular streamers, the event was still one of the game’s biggest to-date, taking place at BlizzCon 2016 in a year that has in many respects belonged to Blizzard’s latest hero-based FPS. And South Korea, the team that went on to win the tournament, did not disappoint. Their dominance culminated in a lopsided grand finals that left Russia choking on their opponents’ fumes. Even among champions, however, it was Won Hyoup “ArHaN” Jeong’s Genji who was star of the show. In perhaps his most stunning play of the tournament, ArHaN linked up with an ultimate from his teamamate’s Zarya to completely obliterate the U.S. in match two of the quarterfinals. Beyond just individual skill and strategic awareness, Overwatch is a game about linking up with teammates to unleash deadly combos, something that’s hard enough in 2D mobas like Dota 2 and League of Legends, let alone the complex 3D environments perceived in limited first-person views. This year ByuN Hyun Woo became the first team-less player to win the South Korean StarCraft league. He did so against a series of great opponents, including across five matches in the grand finals vs. Kim “sOs” Yoo Jin. StarCraft is not nearly as prone to big moments as other esports. Known for champions who excel in part by being able to out-click and out micro-manage their opponents, Blizzard’s long-running real-time strategy game is about accumulating small advantages over time and then combining them to overwhelm the opponent. However, in a series of four spectacular games after conceding the first to SoS, ByuN showed early-game skirmishes around the edges of players’ bases could be as tense as any other competitive video game. By game four, after scarecly five minutes had passed, ByuN was already imposing himself upon SoS with a Liberator that managed to wrack up eight kills before being shutdown, all while repelling his opponent’s attempt at a counter-attack. Juan “Hungrybox” Debiedma, arguably the best Melee player in the world for 2016, almost didn’t win this year’s EVO. His Swedish rival, Adam “Armada” Lindgren, looked to be on his way to maintaining his status as #1. But then Hungrybox came from behind to win the first set in a dramatic finish that paved the way for his eventual victory. Nintendo’s Melee is quick and technical, but moments like the one at the end of the first set’s fifth match show just how elegant it can appear when all the pieces fall into place. 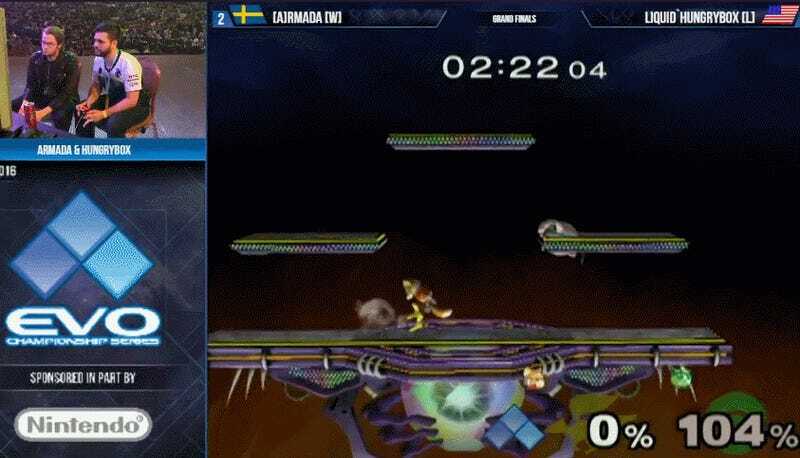 On the brink of death, Hungrbox manages to land a six-hit combo in the span of a few seconds that sends Armada flying off the stage. You can see from his reaction immediately afterwards that even Hungrybox can’t believe what he just managed to pull off. Watch the health meter in the top right. Competetive World of Warcraft PVP doesn’t always get a lot of attention, but the grand finals at this year’s BlizzCon were really something to see. In a stellar seven game series that could have seen either team go on to win it all, it ended up being Splyce who took home the trophy. That was thanks to tremendous plays, including healer Simon “Boetar” Heink who manged to escape death more than once. Positioning obstacles between himself and the enemy team, Boetar managed to hold on for dear life thanks to slim margins that, after all the numbers were crunched, went ever so slightly in his favor, allowing Splyce to rally and counter-attack for the win. Before Du “NuckleDu” Dang become the first American to win the Capcom Cup tournament for Street Fighter, he was fighting his heart out in the Capcom Pro Tour’s North America Regional Finals. His determination and recent form carried him all the way to the tournament’s grand finals to face one of the “five gods” in the Japanese Street Fighter scene: Hajime “Tokido” Taniguchi. NuckleDu seemed to have Tokido’s number the entire series, but especially in the fourth game of the first set, the young American appeared to be playing the game a split second ahead of his opponent. NuckleDu closed out match with grace, nearly breaking Tokido’s guard in the process. Moments later, desperate to create something, Tokido attempted to go on the offensive only to be countered with a jump uppercut into a Guile’s Special Attack. There were a lot of great games at this year’s Worlds Championship, but nothing that quite that the simplicity of Kim “PraY” Jong-in’s arrow in the semifinals on the side of ROX Tigers against the eventual champions, SK Telecom T1. A blind Ashe Arrow fired at 32:37 somehow finds SKT’s Duke, striking the player and preventing him from teleporting back to defend his team’s base. ROX won the game, and despite losing the series, managed one of the most stunning (literally) wins in the entire tournament. This year had a lot of great Dota 2 matches, but nothing can overshadow what occurred at the end of game three of the grand finals of Ad Finum vs. OG. In a marathon of a game that went on for over 75 minutes, it was a few seconds of daring, in a match full of gutsy moves, that helped the all Greek team stop the grand finals from being a blow-out. The match ended when one of AD Finem’s players traipsed into the enemy base using an invisibility buff to evade detection. Thanks to Earthshaker’s attack bonuses, it was just enough to secure victory for the underdogs. While it was not the best Dota 2 play this year in terms of technical execution or skill, it was hands-down the most breathtaking. Olkesandr “S1mple” Kostyliev is one of CS:GO’s best players, and even if he hadn’t gone and gotten it tattooed on his body, S1mple’s stunning no-scope double-kill against Fnatic during the ESL One Cologne major would have been an easy choice. Falling down from a platform on de_Cache like Neo straight out of the Matrix, the young Ukrainian managed to drop his opponents with casual ease, as if he’d Groundhog Day-ed the entire moment a million times before. 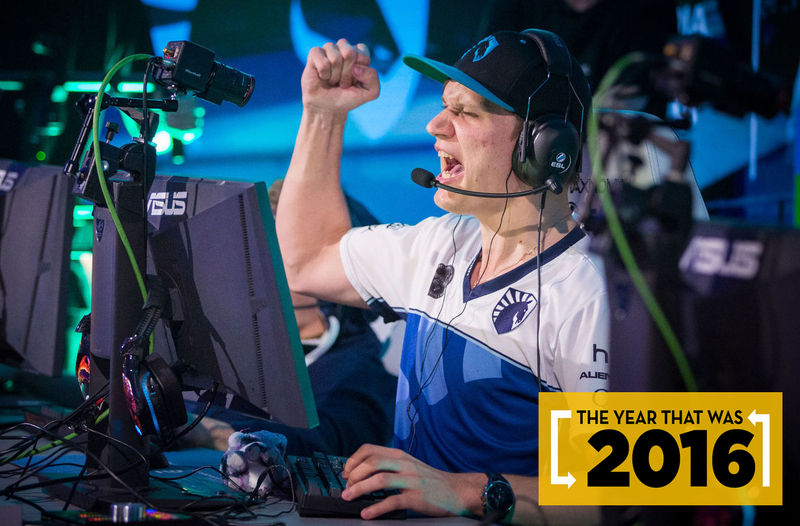 It was on the back of clutch plays like this one that Team Liquid was able to survive the Swedish opposition and go on to become the first North American team to make it to the finals of a major CS:GO tournament. This list is long but could have been even longer. Be sure to add your picks for esports plays of the year in the comments below.